The past few weeks have seen intensifying negotiations in Congress and with the Trump Administration over the fate of thousands of young undocumented immigrants who were brought to the US as children and who received temporary legal status through the Deferred Action for Childhood Arrivals (DACA) program. In September, the Trump Administration rescinded DACA, setting a deadline of March 5, 2018, for Congress to act to extend the program or leave DACA recipients vulnerable to deportation. A substantial majority of Californians and Americans support extending legal status for DACA recipients, as do many Republican and Democratic members of Congress. Recently the debate over DACA has become increasingly urgent, with some Democratic Congress members asserting that action to extend DACA must be included in any deal to continue funding the federal government beyond this Friday, January 19, when the current temporary federal funding agreement expires. Failing to continue legal protection for DACA recipients could have serious economic consequences, whereas extending long-term legal status to DACA recipients and other “Dreamers” (undocumented immigrants brought to the US as children) would produce long-term economic and fiscal benefits. Any action, or lack of action, to extend DACA will have particularly strong effects in California, as there are more DACA recipients here than in any other state. The DACA program was created in 2012 by the Obama Administration as a temporary solution for young Dreamers facing uncertainty due to Congress’s failure to enact comprehensive immigration reform. The policy affirms our country’s values of dignity, human rights, and inclusion by offering temporary protection from deportation and legal permission to work for certain young people who were brought into the United States without legal immigrant status before their 16th birthdays. To be eligible to receive DACA, individuals have to be at least 15 years old, have lived in the US since 2007, have been younger than 31 as of June 2012, and have completed high school or be enrolled in school, among other criteria. As of September 2017, there were 689,800 active DACA recipients nationwide. On September 5, 2017, President Trump directed the Department of Homeland Security to stop accepting new DACA applications and phase out the program, with no renewals allowed for individuals whose protected status expires after March 5, 2018. When their permits expire, current DACA recipients would no longer be protected from deportation and would lose their permission to work in the US legally. A recent court injunction in a set of five related cases challenging the Trump Administration’s termination of DACA (filed by California’s UC Regents, the State of California, the City of San Jose, and Santa Clara County, among others) means that DACA recipients can continue to renew their status, at least in the short-term. However, the preliminary injunction does not resolve the long-term uncertainty about DACA recipients’ legal status, and the Trump Administration has already announced plans to appeal the judge’s order. 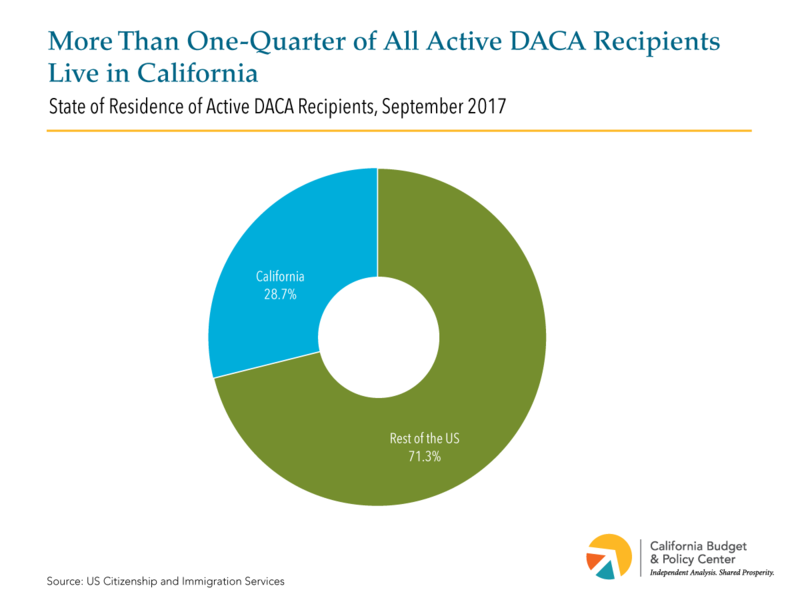 As of September 2017, there were 197,900 active DACA recipients in California, representing more than 1 in 4 active DACA beneficiaries nationally (see chart below). DACA recipients with permits expiring before March 2018 who missed a quickly announced deadline to renew their status in October have been losing their protected status at an estimated rate of more than 100 per day. This means that the number of California DACA recipients who will still have active protected status as of the end of January 2018 will be somewhat smaller, estimated at about 192,500 per Budget Center calculations. Those whose status has expired since September 2017 can apply for renewals now as a result of the recent court injunction, but the injunction will cease to apply if the legal challenge is ultimately denied. Dreamers with active DACA status have grown up in the US, and many have deep roots in local communities. They are also important contributors to the economy. Administrative data on the percentage of current DACA recipients that are employed are not available, but estimates range from more than half (with most of the non-working individuals enrolled in school) to nearly 9 out of 10. Under this range of employment estimates, California’s DACA workers currently contribute an estimated $6.5 billion to $10.3 billion to the state economy annually, or an estimated $32.7 billion to $51.7 billion over five years, according to Budget Center analysis. DACA recipients who are not working while they attend school can be expected to enter the labor force in the near future. Considering this important contribution to economic output, a lack of action on DACA resulting in deportation of all or some DACA recipients (or forcing DACA workers out of legal employment) could have serious economic consequences. Leading Senate proposals to address the expiration of DACA, including the bipartisan DREAM Act and the more conservative SUCCEED Act, have formed the basis of recent bipartisan negotiations to resolve the DACA issue. These proposals include a process for individuals to secure longer-term legal immigrant status and an eventual path to citizenship, conditional on working and/or completing a college degree, as favored by most Americans. These proposals would also extend legal protection to a somewhat larger group of Dreamers beyond those who currently have active DACA status, such as Dreamers who were eligible but never applied for DACA and some who were not yet old enough to apply for DACA. With secure long-term legal status, Dreamers could make significant long-term economic contributions to local communities, states, and the US as a whole. These contributions would include substantial financial support for public systems and services in the form of tax payments. Over their lifetimes, California’s current active DACA recipients would contribute an estimated $77.6 billion in federal, state, and local taxes if they were allowed to remain in the US (see chart below). * The estimated lifetime federal, state, and local tax contributions of the larger group of immigrants in California who would be eligible for the DREAM Act would total $202.4 billion. California’s state legislators have implemented several policies to help Dreamers — including laws that protect students from immigration enforcement activities and that fund legal services and student aid for DACA recipients — but states have limited ability to influence US immigration policies. Ultimately, the fate of these young people is in the hands of federal lawmakers, including California’s Congressional delegation. Time is rapidly running out for Congress to find a permanent legal resolution for the hundreds of thousands of Dreamers whose lives are currently in limbo, including nearly 200,000 young Californians with current DACA status. Providing Dreamers with long-term legal status would generate substantial economic and fiscal benefits for California and the US as a whole and would recognize the important past and future contributions of these young people to the only country that many of them have ever known as home. 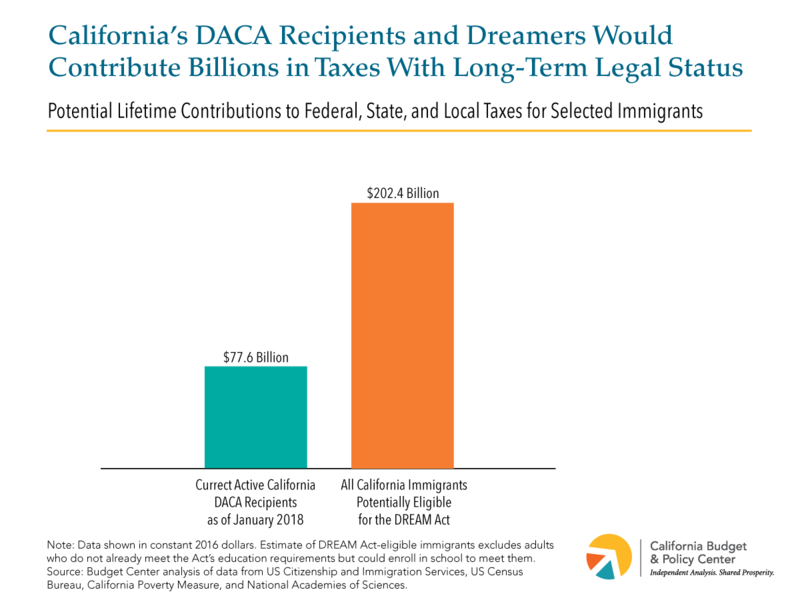 * Potential lifetime tax contributions were calculated by multiplying the estimated number of Californians with active DACA status and the number estimated to be eligible for the DREAM Act by a conservative estimate — from a National Academies of Sciences immigration study — of the average individual contribution to federal, state, and local taxes, over a 75-year period, for an immigrant arriving in the US between the ages of 0 and 24, by levels of educational attainment. Access to long-term legal status was assumed to lead Dreamers to improve educational attainment to match the distribution of attainment of their native-born Latino peers.